ZENT CERUMO SC430 come from behind to score a brilliant win. 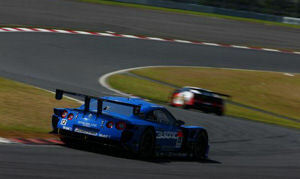 The Fuji GT 250km race, round 6 of the 2011 Autobacs Super GT series, took place at the Fuji Speedway in Shizuoka Pref on Sept. 11. In the GT500 class race the No.38 ZENT CERUMO SC430 of Yuji Tachikawa and Kohei Hirate claimed its first GT victory in two and a half years with a dramatic come-from behind win in the last three laps. 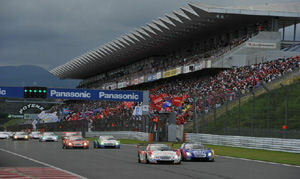 At 2 p.m. in the afternoon, the 55-lap race began under cloudy skies with the air temperature at 29°C. and the track surface temperature at 39°C. The front of the starting grid was monopolized by Lexus SC430 machines, and they began the race with no major mishaps or upsets at the start. The first machine through the opening lap was the No.39 Denso SARD SC430 driven by Hiroaki Ishiura, but right on its tail throughout the early stages of the race was the the No.38 ZENT CERUMO SC430 of Kohei Hirate in hot pursuit. Following in third position came the No.6 ENEOS Sustina SC430 of Kazuya Oshima and in fourth came the No.35 D'Station KeePer SC430 of Andre Couto. However, the two leaders gradually pulled away from the rest of the field and the race became a showdown between the two Lexus SC430's. The SC430 teams remained dominant in the early stages of the race, until Couto in the No.35 D'Station KeePer SC430 began to fall off the pace rapidly after the tenth lap. He was passed by one machine after another over the 13th and 14th laps, allowing Hideki Mutoh in the No.8 Arta HSV-010 to move into fifth position, only to lose this position again by running off the track at the Coca Cola Corner of lap 14. Moving up next to claim the fifth spot was the No.12 Calsonic IMPUL GT-R. After running off the track, the No.8 Arta HSV-010 went straight back to the pit, where it was lapped by the field. More trouble was in store for the SC430 teams, as the No.6 ENEOS Sustina SC430 also fell off the pace while running in third position and was passed by the No.36 PETRONAS TOM'S SC430 of Andre Lotterer at the Dunlop turn of lap 17. 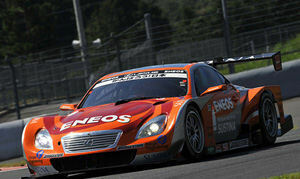 In the same way, both Oshima in the No.6 Lexus SC430 and Couto in No.35 dropped far back in the field. Meanwhile, the two lead machines increased their gap over the rest of the field as they ran on in an intense duel with only a few tenths of a second separating them until the No.38 ZENT CERUMO SC430 made its routine pit stop first at the end of 24th lap. The driver change put Yuji Tachikawa at the wheel of No.38. On the next lap (25) the No.39 Denso SARD SC430 also made its pit stop and changed drivers to Takuto Iguchi. Helped by some fast pit work, Iguchi was able to return to the race with a 2-second lead over Tachikawa.